I’m taking a new approach to my blogs where as soon as I write the blog post, I publish it. In the past, I would schedule the posts so they appeared one a day. I do like the idea of the consistency of a post per day, and having them spaced out. I’m putting the “log” back into weblog, where my blog is a log. Not my blog being “this is an incredible article”. Several years ago, everyone was saying how you have to write AWESOME blog posts. Posts that are over 2,000 words. Incredibly rich and detailed. While I totally agree with that approach, it also pretty much killed my blog posting. I became fearful of making posts that were too short. So the drafts sat in my Evernote. 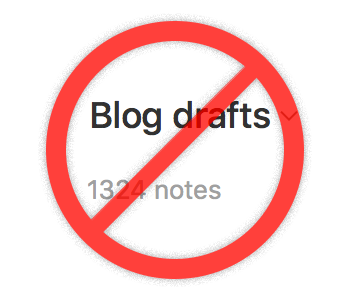 One-thousand three-hundred and twenty-four drafts currently sit in my Evernote. That’s just stupid. Unused drafts. Now I’ll go back to posting short blog posts. Looking back at the history of my blogs, I would often make quick little observations. I loved it. Have a thought, boom, post it.